Hello lovelies! How are you all doing? Today I thought it'd be fun to share with you what I learned from the GBS2015 Conference! Over the course of the 2 days there were 9 amazing ladies (and guy!) who are bloggers or business owners who are killing it and making a name for themselves! They gave some on point advice about blogging and running a business so I'm going to share it with you guys! Alissa Circle of Diary of an Addict and the founder of Pollinate Media Group talked about branding and how be your best blog/business self. My favorite quotes was "Take fear by the balls and make your dreams happen!" How many of us don't go for something because of our fear? I know I certainly do! It's time to put fear in it's place and go for whatever it that you want. Maybe it's a promotion at work, starting your own business or collaborating with a brand you love. "Our own fears hold us back from what we are designed to do!" Next I learned from Kelly and Andra of With Grace and Gold that "Followers ain't nothin but a number!" As a blogger we get caught up in the digits that come along with blogging. How many page views we have, how many followers, how many likes we get on Insta. I know personally, I let those little numbers rule. If I post a picture and it doesn't get a like within the minute I freak out. Kelly and Andra spoke about focusing on loyalty, profitability, engagement, enthusiasm, steady growth, hardwork, the journey and having fun, instead of the number of followers or pageviews you have. You are not your number! Mandy of Sugar Bee Crafts talked about building a blogging community. My favorite thing I learned was that "As you know who you are you find like minded people." By figuring who you are as a blogger and a person will help you find other people who are the same. This is your blog tribe. Your blog tribe is the small group of people who you go to for advice and such about all things bloggery. I'm slowly but surely building my blog tribe and I can't wait to find that core group of people! Finally, Enza of Enza's Bargains spoke about brand campaigning. What I took away from her was to "Under promise and over deliver." When working with brands and companies always go above and beyond what they ask. This will make them look good and also show that you put forth a lot of effort into it. Never do just okay, always do extraordinary. All of the speakers talked about telling your story and how each one of us have one to tell. I loved that they all touched on topics that I learned from the GBS Workshop. More specifically what Jenny Singh of Touch of Ambition talked about. "You are a creator, a dreamer and a storyteller." 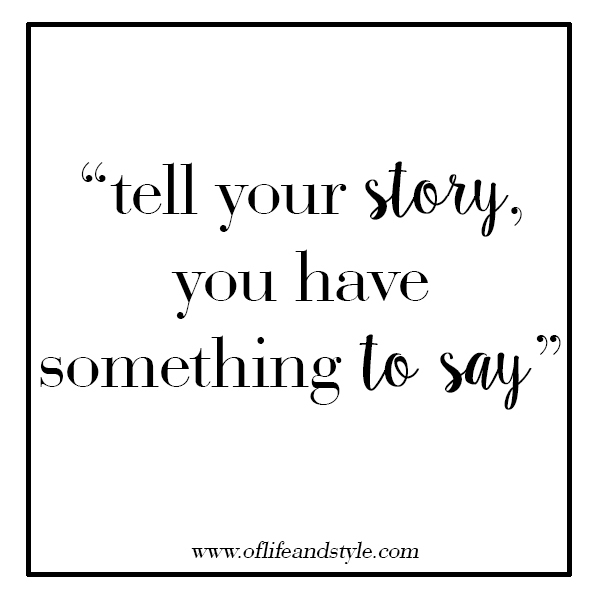 That we all have a voice and a story to tell. I hope you can take something away from this post whether you blog or not. I learned so much that it's hard to just pick a few things, but these are all quotes that really stuck out to me. Do you have any nuggets of wisdom? Something that's really stuck with you? If so offer it up below or strike up a convo with me via social media, @samantha_goble! "i'm a blogger, what's your super power?"